Yesterday Brian and I went to see Dandia Dhamaka, which was an intercollegiate raas dance competition. Raas is a folk dance from the Gujarat region in western India, and it’s great, very high-energy and fun to watch. (Here’s a video of the University of Michigan group from 2007.) I say “folk” dance but it was a competition between ten college teams, so a lot of the groups worked in cute themes with their introduction videos — one had a Willy Wonka theme, there were two circus themes (probably a source of some consternation) and a couple I couldn’t figure out what precisely the teams were going for because I couldn’t hear very much over the clown with drums leading the “Go Blue!” chant a few rows over. (I was grateful to the group that subtitled their video.) I haven’t found out who won yet, but I really liked the University of Miami’s overall energy, Michigan State University’s choreography and University of Michigan’s costumes. Of course I loved the costumes in general, which were all brightly colored and dripping with mirror embroidery, bold designs and metallic fabrics. From our balcony seats I couldn’t get a great look at the details (specifically I’m a little sketchy on how the dupatta is fastened to the top of the skirt) but the overall effect was dazzling, especially for the moves where the girls get flipped over the guys, which fans out their skirts. I liked Michigan’s costumes best because they looked sophisticated and very nicely done. The skirts had a huge amount of shiny decoration covering the front, and then the back was only lightly decorated, so the audience saw both the front pattern and the rich-colored fabric as the dancers moved. They kept to just maize and blue, too, but with the guys in mostly maize and the girls in mostly blue there was enough contrast to be interesting. MSU’s group, to me, went over the edge in the costume department: their costumes looked to be the most sumptuous with rich jewel tones and gold accents, but from where I was sitting the men and women looked to be wearing the same thing cut differently, and it was just a little too busy. Still, I liked their dancing best, so let it not be said I’m biased against Spartans! Anyways! Yeah, hello. Brian says that’s why he never makes New Year’s resolutions, because then you never do them anyways. So I decided to make a New February resolution, which was not to take any guff from my husband. In entirely unrelated news, here’s a paperdoll outfit. So I started a belly dance class (beledi, to be precise) a few weeks back. Unsurprisingly, it’s always been something that appealed to me (fancy veils! shiny coins! etc.) but I’m ridiculously uncoordinated, disconnected from my body, overweight, quite self-conscious, can’t tell my right from my left, and in every way am the type of person who should stay well away from dance classes. But once I got over the abject terror involved in stepping into the studio and completing the first class, I was hooked. Hip shimmies are a lot of fun if you’ve got plenty of hip to put into them, for one thing, and the movements are something I can usually do once I watch closely and practice for a bit. Of course I’ll never be a “dancer” in any way; people say “just let go” and “just follow the music” and “don’t think about it” and apparently I walk around in a near constant state of tenseness because all that is impossible for me. In class I feel like I’m translating everything the teacher does into a flowchart for me to follow and when I do something with my body that I can’t explain with words, like pivoting or this one veil move, it’s really quite unsettling for me. Anyways, as far as I know (and keep in mind I’m a total noob) there are two styles of costumes, cabaret and tribal, cabaret being the highly beaded bra and skirt look and tribal going for a more ethnic, fantasy look. 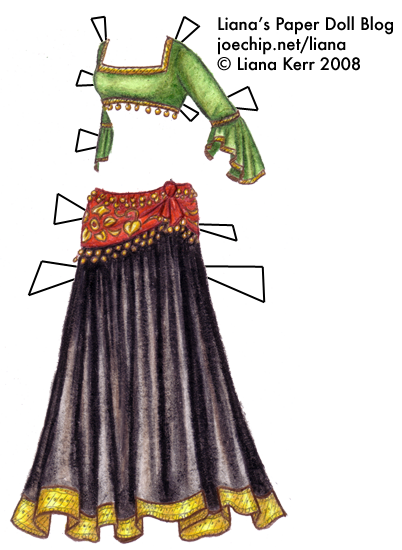 I really like the tribal look, so that’s what I went with for this paper doll. She’s got a green choli, a red hipscarf and a black full skirt, all trimmed with gold and gold coins. 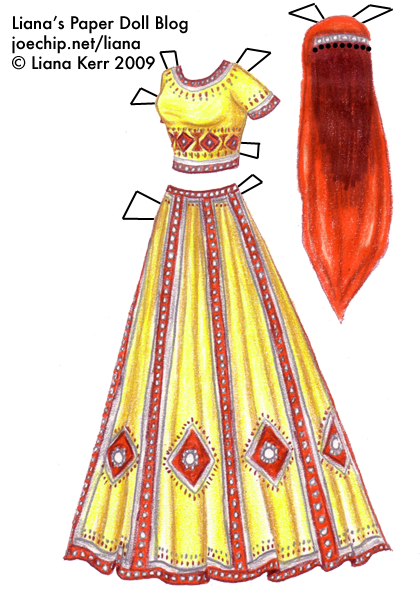 I covet the choli I drew for my doll, but I’m not so sure I’d have the courage to wear it! At the moment, the vampire has pulled ahead… there’s still time for the Good Queen to come back ahead though.